We had a great time this Halloween! The girls are a little older and able to do more things in celebration of the wonderful time of year...FALL. 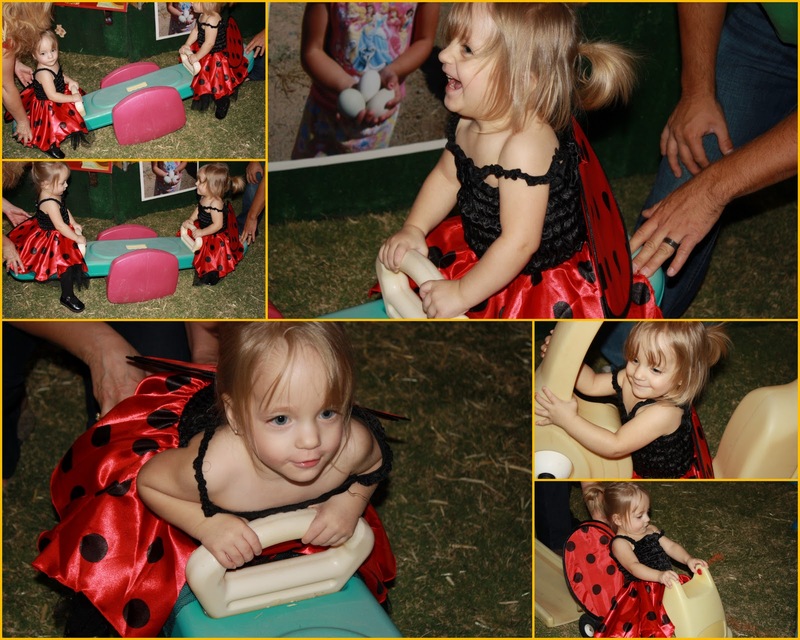 First we met up with Victoria, Grandma, Nana and Papa at a trunk n treat. This was the first and last for us! We we're amazed at how many people were there! Think thousands!!!! Our girls don't really eat candy now anyway so we took them straight to the activies. We found a little area in the corner of the park, which was just for the girls' age group. They had the most perfect toys for them to play on! chomp on some little girls finger. 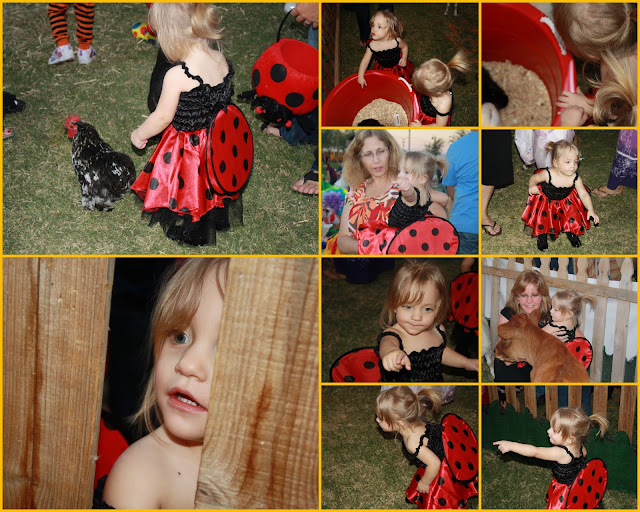 Being the protective parents we are, petting zoo time was over. 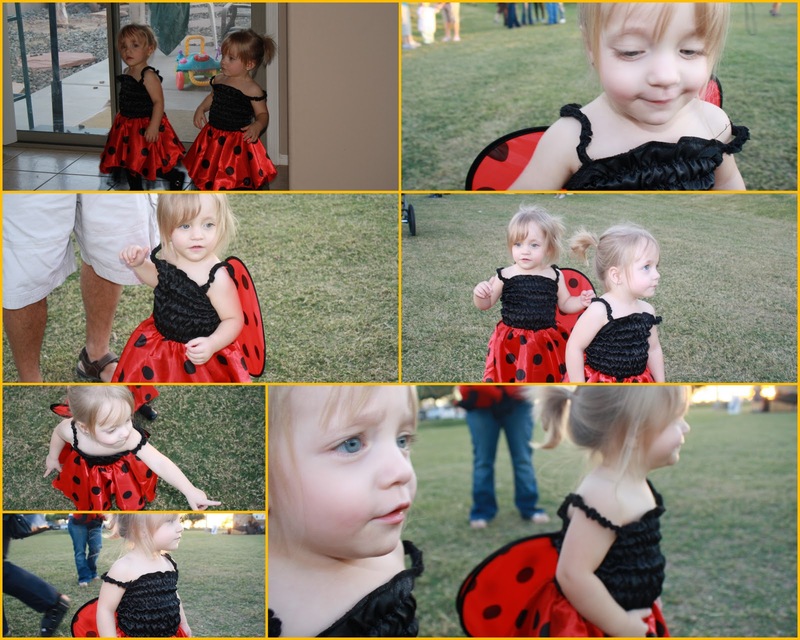 CUTEST little lady bugs in the WORLD!!!!! It started to get a little chilly and late for the girls so Victoria and Grandma took the girls to their house for a slumber party, while Shawn and I went to Stacy and Dylan's party. Best Halloween party of 2010!!! Bringin' the 20's back baby! Lets just say its a good thing the girls did not witness the scariness going on here! Great Costumes! Its no wonder Papa won the best costume award! Shawn looking happy sitting on the spooky electric chair. Shawn not looking so happy... HAHA!!! Alicia and Mike took the most awards. Best couple and Alicia with her adorable costume... most original!! Mario and Luigi even joined the par-tay!! Shawn and his beautiful Grandmother! This is when the night got really fun... You ready for this?! Who would have thought that Papa would have made an electric chair not only for decor but for pure entertainment! Awe yes, not sure who's genious idea this was... We all got into a big circle and shocked our selves. It was certainly the highlight of my night! Good times at the Mealeys'! The amazing hosts of the night! Thanks for a great time guys. As usual we had a blast!